Bedford A stumbled again in their quest to avoid relegation. The teams here may find the evening’s match point valuable by the end of the season as they both advance to 8 points from 8 games. Richard Freeman played a lively game against Mindaugas but his attack foundered and I don’t think he missed any chances. Steve steered to a better bishop endgame against the fast-moving Philip Ekhaesomi. The remaining games were not looking good. James contrived to lose the exchange and, despite reduced material, Ray Holland managed to convert R and P v N and P. Rob Whiteside had a strong initiative going into an ending but I just about equalised and was happy to accept a draw. Mike lost a pawn in the middle game and went into a double rook ending where his only asset was a passed d pawn. 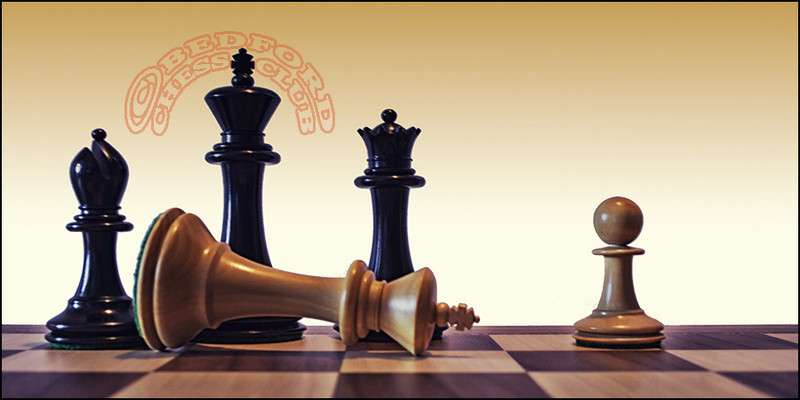 However, Peter Clarke, by now two pawns up, managed to neutralise the counterplay and Mike resigned. Leighton Buzzard A drew their penultimate match against Milton Keynes A. They now need only a point in their final match (against Bedford A!) to secure the title. That all assumes their closest challengers (Bedford B!) manage to overcome Milton Keynes B (clearly not easy) in their final match next week. Rich Freeman passed me (John H) his scoresheet after the game. Mindaugas’ play was near enough flawless except for one missed opportunity. See if you can spot where he went wrong. Black could have exchanged rooks on move 25, followed by 26…Nf2+, with a smothered mate, or back rank mate if white plays 27 Rxf2. As I said before, smothered mate is usually confined to the notes, although I suspect Richard would have allowed it! After 23. Qe8+ then 23…Raxe8 followed by mate on h6 would be a useful counter! Yes sorry, doing it from memory, 23.Rf1 just wins easilly. The missed opportunity is much simpler and clearer than any of this! Does 21…Ng3+ then Rf6 win the Queen? Don’t think so Gerry, 22.gxh3 Rf6 23. Qe8+. It’s much less subtle than that anyway, try again! Weirdly hard to spot the missed opportunity, but obvious when you do – only one point for a win anyway, interesting game.